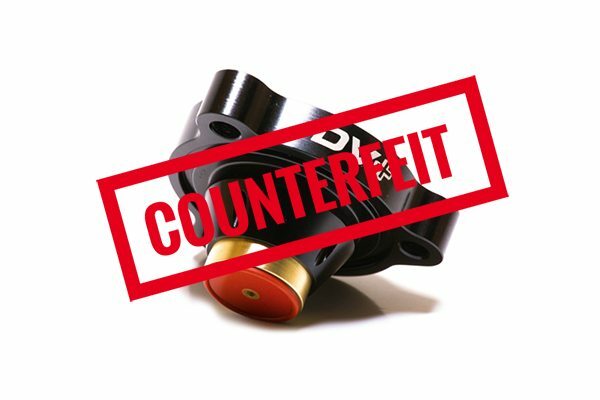 Counterfeit parts are being fraudulently advertised and sold as GFB products, these could cause damage to your turbo! We have become aware of a number of poor-quality counterfeits of GFB products hitting the market, most commonly the DV+. We always knew unscrupulous operators would try to cash in on a successful product that looks easy to copy, but what makes it even worse is that they are being MARKED, ADVERTISED, and SOLD as “genuine” GFB products, which they are not. They are also being sold at a price not far below our MSRP, which means you cannot spot a counterfeit simply because it is cheap. To the buyer, this is particularly of concern because a number of customers have already been duped, paying almost full retail for a part that is worthless and potentially damaging to their car. We have received a few of these copied products to inspect and test them, and the results are not pretty. Despite the appearance of simplicity, the DV+ does actually have several key areas in its construction that are critical to its operation and reliability. Tolerance and surface finish of the piston is one, and bonding of the piston face seal is another (refer the picture here taken from a counterfeit product). If the tolerances are wrong, the valve will not work properly, causing boost leaking or jamming. If the piston face seal lets go (or more correctly, WHEN the piston face seal of the fake lets go), it will go straight through the turbocharger. That’s if you even manage to bolt it onto the car in the first place – some copies are so poorly constructed they don’t even fit together. Unfortunately the copies are difficult to pick from photos alone, especially since they are often advertised with photos, instructions and all the marketing material from our own website! However, once you open the box it is quite easy to spot a counterfeit. This won’t help if you have already purchased the product online, as often the seller who is passing off these counterfeits as GFB will not respond. While we are making every effort to combat this, if purchasing from an online marketplace and you would like to find out if the seller is authorized, please contact us or verify the dealer is authorized in the “dealer locator “section here. If buying goods advertised as second hand, verify the proof of purchase before purchasing. By doing so (and retaining your proof of purchase) your genuine GFB product will be covered by our warranty policy, as we always stand behind the products we make. So, to avoid possible turbo damage and getting ripped off, please take care where you buy from (especially EBay, and any Chinese online sellers) and if you see or receive a GFB product that doesn’t look right, please contact us at support@gofastbits.com.au so we can take action against the sellers of these counterfeit products. Previous PostTMS Respons: Don’t throw your GT-R boost away!